You may have noticed that we at Digital-Lifestyles have never been massive fans of the iPhone. That doesn’t mean that there aren’t millions of people who are. One such is tech-chum Richard Lai. Not only is iPhone fandom in his blood, but so it writing, photographing and documenting. In pursuit of those passions, he got himself down to the Apple store in Regent Street – 1) to get in line to buy a new iPhone 3GS 2) to live blog the experience. His first post was at 5:20am this morning where he found a deserted Regent Street, apart from the five people who were already queueing. The first in line had been there since 3am having caught a cab from Hayes, worried that he long queue may have formed already. 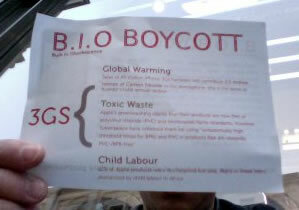 It’s not just Apple fans that are there, people have been up and down the growing queue handing out “B.I.O (Built in Obsolescence) Boycott” leaflets. 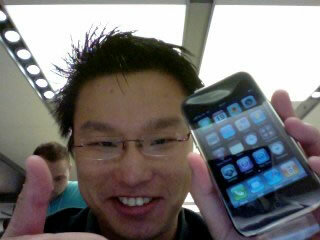 By 8:01 Richard was proud owner of a new iPhone 3GS. There’s loads more detail on Richard’s site. I love the fact that despite all the hype, Apple’s plans to produce another ghastly high fivin’, all-whoopin’ celebration of high end consumerism in London has failed miserably. It’s a good phone but what’s the point in freezing in line like a fanboy plonker all night when you can just go in on your way to work later?